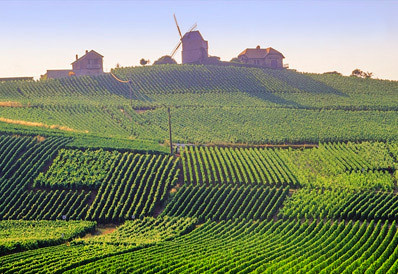 The existence of vineyards in Champagne dates back to the beginning of our era. The Romans were the ones to introduce grape-growing in the Champagne region like in the other main French wine regions. They had already identified the originality of the soil that gives Champagne its specificity, a transitional oceanic climate, chalky subsoil and sloping landscape. From antiquity to the 16th century, the history of the region was intimately associated with the production of still red and rosé wines. Today is only remaining the Bouzy red wine. The Champagne were knowing now only appeared in the 17th century, once people began mastering the natural effervescence of the local wine and pruning the vines and blending crus and grape varieties. Most historians said that it’s the monk Dom Perignon (no real connections to the brand) in the village of Hautvillers who did it the first. In any case he made it famous. It became the wine of the high society and the noble people. 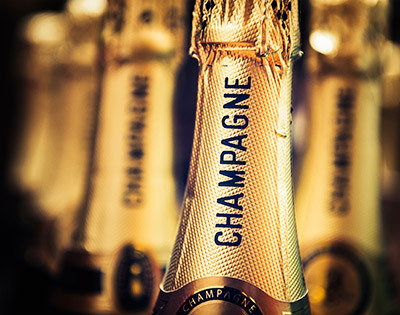 The Champagne became the wine of coronations, the wine of kings, the king of the wines… Its success spread to the aristocratic elite of the world in the 19th century thanks to the energy of the Champagne Houses, which made it the symbol of French spirit. After 1945, the Champagne frenzy reached new social circles. The current annual production exceeds 300 million bottles. The geographical area which make the Champagne is made up of several soil types of different characteristics. The subsoil in Champagne is predominantly limestone. So too are the outcrops of sedimentary rock (75% limestone), composed of chalk, marl and limestone proper. This type of subsoil provides good drainage and also bring some unique mineral flavors. 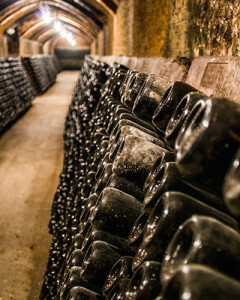 According to an age-old tradition, each Champagne House chooses during the wine harvest the particular vineyards and the wine-plants which make up theirs supplies of grapes. In spring, the wines from each vineyard are analyzed and tasted in order to define theirs particular characteristics. The Head of the Champagne House and the oenologists can then determine the proportions in which the new wine is assembled and there for completed by adding some reserved wines from past years. Once bottled, the wine becomes effervescent, then ages slowly in deep wine cellars which guarantee to the wine peace and quiet, constant temperature, darkness and humidity required for perfect maturation. The world-wide renown Brands of Champagne are devoting their attachment to the respect for these traditional rules of Champagne-making. Therefore a great Brand of Champagne brings to both the connoisseur and novice alike the certainty of being fully satisfied. At the opposite of the other French wine regions in Champagne the consistency from a year to another one is a key element. The underground cellars or ‘crayeres’ of the champagne houses are the main attractions for most of the Champagne visitors. The most prestigious ones are former chalk mines of the Gallo-Roman time (around 60 years AD)originally used to build Paris and all the cities of that area. They are perfect to maintain a constant 10° Celsius whatever the seasons to preserve the wines over the time. 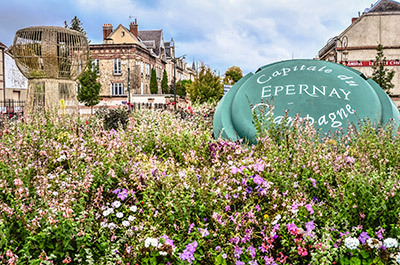 It is estimated that there are in Reims, the Champagne capital, more than 2,000 chalk quarries with an extraction volume rate over the centuries of 300,000 m3, most of which was used in the city’s defensive rampart walls from the 13th. to the 14th. centuries.